The DVD skilfully combines commentary from the authors, standing with the appropriate section of the battlefield behind them, accurate and colourful maps, and footage of re-enactment groups acting out the stages of the battle. There is also coverage of arms and field drill. A high quality product, within a high quality series. DESCRIPTION: The ease of production of DVDs has produced a large number of well-written DVDs that are let down by poor production quality. This DVD is not only well scripted but also well produced. The lighting is good and the colours vibrant. Each section moves smoothly on from the preceding section demonstrating good editorial control. The writers are members of the Guild of Battlefield Guides with the eye for the land of a soldier, avoiding the irritating mistakes that some historians make through an inability to read the land. The Waterloo Collection set high standards from the start and this DVD concludes the battle that set the shape of Europe for two centuries. Some French historians have claimed that Napoleon won the battle but that it was mysteriously stolen from him, in much the same way that some German historians claim that Germany won both World Wars but was betrayed by sections of the German population. 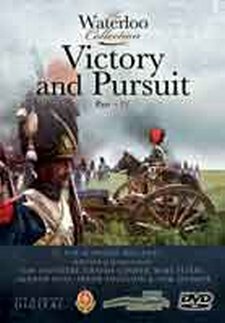 The BHTV team convincingly demonstrate that the French were not only decisively defeated on the field of battle, but that the battle ended in a rout where Napoleon had to fight his own soldiers to escape the field. This was also the one battle of the Napoleonic Wars where the Imperial Guard were broken on the field, a shock that encouraged the rout. The DVD skilfully combines commentary from the authors, standing with the appropriate section of the battlefield behind them, accurate and colourful maps, and footage of re-enactment groups acting out the stages of the battle. There is also coverage of arms and field drill. A high quality product, within a high quality series.